A connection made during a culinary arts class at Delaware Tech led to a business partnership that is taking Delaware’s food truck scene by storm. When Nathan Bradford enrolled in Delaware Tech’s culinary arts program, he already knew the field was a good fit for him since he had been working in restaurants since he was 15. 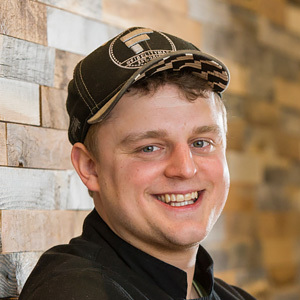 After graduating from Delaware Tech in 2013, he connected with a former classmate, Mike Stanley, who asked him if he wanted to go in on a food truck business called “Wildwich.” The truck would specialize in delicious and innovative sandwiches such as the popular K.C.Q. and the Jolly Mon. In July 2014, the two friends started the business in a converted truck that travelled to food truck fairs, festivals and competitions. The Wildwich concept and food took off, and soon the business partners attracted investors and expanded to a bistro on the Wilmington Riverfront and now a new café in downtown Wilmington. The café opened in February 2016 and features fast, friendly service and an ever-changing menu of sandwiches, salads, and fresh drinks. Nathan credits his time at Delaware Tech for creating connections that have helped him find a gratifying career that allows him to use the skills he learned at the school and in life. The business has plans to expand and Nathan is excited to see where the future – and his food truck – will take him.